Saberimoghaddam, A., Bahri Rasht Abadi, M. (2017). Parasitic Effect of Tube Wall Longitudinal Heat Conduction on Cryogenic Gas Temperature. Iranian Journal of Chemical Engineering(IJChE), 14(1), 15-25. A. Saberimoghaddam; M. M Bahri Rasht Abadi. "Parasitic Effect of Tube Wall Longitudinal Heat Conduction on Cryogenic Gas Temperature". Iranian Journal of Chemical Engineering(IJChE), 14, 1, 2017, 15-25. Saberimoghaddam, A., Bahri Rasht Abadi, M. (2017). 'Parasitic Effect of Tube Wall Longitudinal Heat Conduction on Cryogenic Gas Temperature', Iranian Journal of Chemical Engineering(IJChE), 14(1), pp. 15-25. Saberimoghaddam, A., Bahri Rasht Abadi, M. Parasitic Effect of Tube Wall Longitudinal Heat Conduction on Cryogenic Gas Temperature. 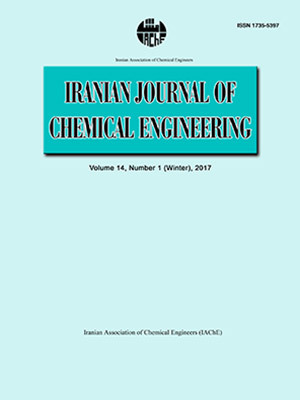 Iranian Journal of Chemical Engineering(IJChE), 2017; 14(1): 15-25. Longitudinal heat conduction is an important parameter in the cryogenic field, especially in cryogenic heat exchangers. In the present work, the parasitic effect of tube wall longitudinal heat conduction on temperature measurement has been studied in cryogenic laminar hydrogen flow. The effects of various parameters such as wall cold end temperature, wall thermal conductivity, gas volumetric flow, and tube wall thickness have been investigated by finite element method. The model was also validated versus the data obtained from experiments. The simulations showed that the temperature decrease in gas flow occurs in the end section of tube length. This section is independent of tube cold end temperature and causes for large temperature measurement error in laminar flows. Results showed that a few millimeters change in temperature sensor position results in measurement errors up to 80 %. The higher tube wall thermal conductivity and tube wall thickness result in higher parasitic effects of longitudinal heat conduction. Pacio, J. C. and Dorao, C. A., “A review on heat exchanger thermal hydraulic models for cryogenic applications”, Cryogenics, 51 (7), 366 (2011). Aminuddin, M. and Zubair, S. M., “Characterization of various losses in a cryogenic counterflow heat exchanger”, Cryogenics, 63 (2), 6477 (2014). Krishna, V., Spoorthi, S., Hegde, P. G. and Seetharamu, K., “Effect of longitudinal wall conduction on the performance of a three-fluid cryogenic heat exchanger with three thermal communications. International”, J. Heat Mass Transfer, 23 (3), 62567 (2013). Gupta, P. K., Kush, P. and Tiwari, A., “Second law analysis of counter flow cryogenic heat exchangers in presence of ambient heat-in-leak and longitudinal conduction through wall”, Int. J. Heat Mass transfer, 50(23), 4754 (2007). Nellis, G., “A heat exchanger model that includes axial conduction, parasitic heat loads, and property variations”, Cryogenics, 43(9), 523 (2003). Narayanan, S. P. and Venkatarathnam, G., “Performance of a counterflow heat exchanger with heat loss through the wall at the cold end”, Cryogenics, 39(1), 43 (1999). Ranganayakulu, C., Seetharamu, K. and Sreevatsan, K., “The effects of longitudinal heat conduction in compact plate-fin and tube-fin heat exchangers using a finite element method”, Int. J. Heat Mass transfer, 40(6),1261 (1997). McCarty, R. D., Hord, J. and Roder, H., “Selected properties of hydrogen (engineering design data)”, National Engineering Lab., N.B.S., Boulder, CO 80303, USA, (1981). Incropera, F. P., Introduction to heat transfer, 6th ed., John Wiley & Sons, (2011).